International Journal of Research in Health Sciences,2014,2,1,320-325. 1-MS. Ph.D*, Associate Professor, 2,4-M.Sc, Assistant Professor. 3-M.Sc. Ph.D, Professor, Department of Anatomy, Chettinad Hospital and Research Institute, Kelambakkam, TamilNadu, INDIA. Aim: Flexor digiti minimi brevis (FDMB) is one of the hypothenar muscles, which is subject to lot of variations. Its close relation to the ulnar neurovascular bundle makes it an important muscle. The developmental basis of FDMB, along with its clinical significance with respect to the ulnar nerve and artery were studied. 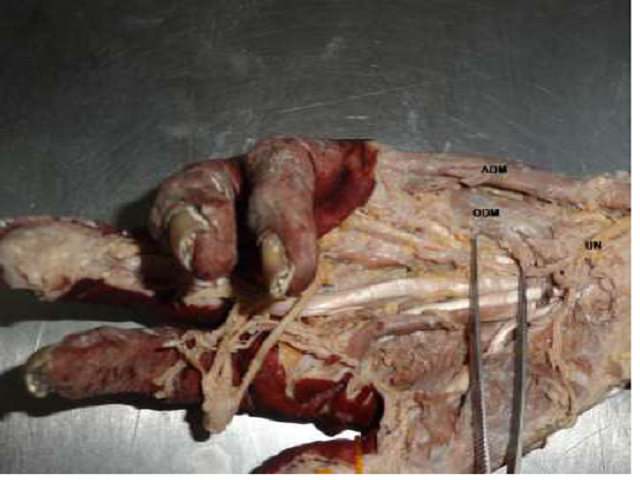 Materials and methods - A total of hundred upper limbs (80 male and 20 female) were studied for the presence or absence of FDMB along with the presence of accessory slips in the hypothenar muscles and its relation to ulnar nerve and vessels in detail. Results: Of these hundred, five limbs showed absence of FDMB. Out of these five variant limbs, two had the presence of accessory abductor digiti minimi along with the absence of FDMB. Conclusion: FDMB is an important landmark within the Guyon’s canal. Its absence or presence of accessory slips can result in hypothenar hammer syndrome of ulnar artery and/or in compression neuropathy of ulnar nerve, both of which are closely related to hook of hamate and FDMB. The reason behind such an absence or duplication is either non division or excess division of the ventral muscle mass respectively, which forms the hypothenar group of muscles.